Upon arrival, you will be welcomed by our guide and driver at Siem Reap International Airport. Then you will be transferred to hotel for check in, before have a lunch at hotel. Afternoon visit Ta Prohm temple which is a wonderful combination of human genius and natural beauty! Giant trees have grown here for centuries. Then continue to Damnak Lounge Restaurant for dinner. 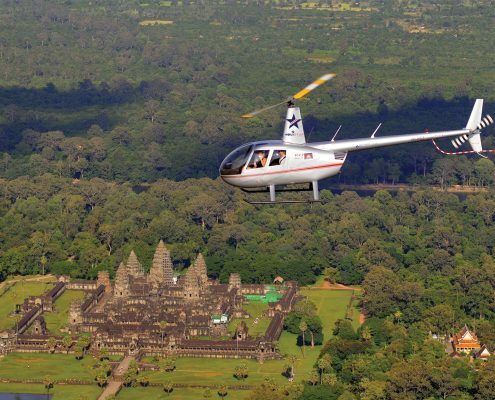 In the morning, you will have 30 minutes chance to explore Angkor Wat, Floating Village, Roluos Group Temple by helicopter. 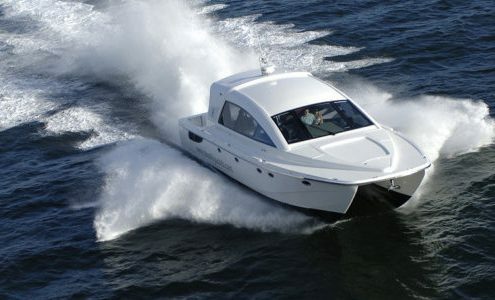 It’s such an excellent experience you should try at least once in a lifetime. Continue with exploring South Gate of Angkor Thom known as Big Angkor, 3km2 walled and moated royal city and was the last capital of the Angkorian Empire, The famous Bayon Temple was an architectural muddle, in part because it was constructed in a somewhat piecemeal fashion for over a century. 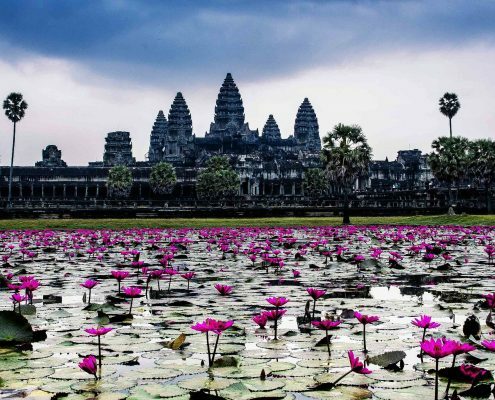 After having lunch, you will visit Angkor Wat temple, the founder of the temple was Suryavarman II who reined Cambodia from 1113 to 1152 and built the five towers in the 12th century to dedicate to the Hindu God Vishnu. The plan of the pyramidal conception of the temple combined with spaces, alleys, ditches is an ancient masterpiece of architectural design and construction. 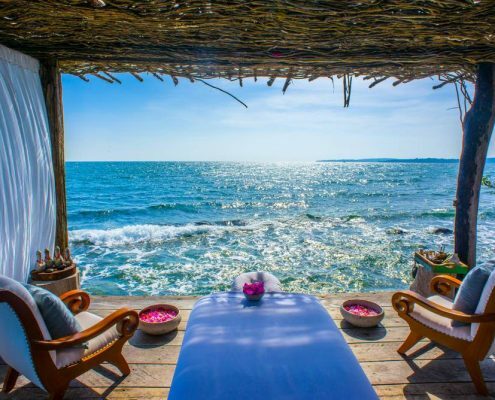 Then you will share a romantic evening with the people you love, refresh yourself in the evening of the beautiful at Tonle oum under a glorious sunset best cocktail and mixed drink recipesThis is a day you are sure not to forget. Continue with a dinner at restaurant and then back to hotel. Morning visit Banteay Srei temple, the citadel of women, located away from the main monuments is the Banteay Srei temple, one of Angkor’s highlights. This temple contains the finest, most intricate carvings to be found in Angkor. 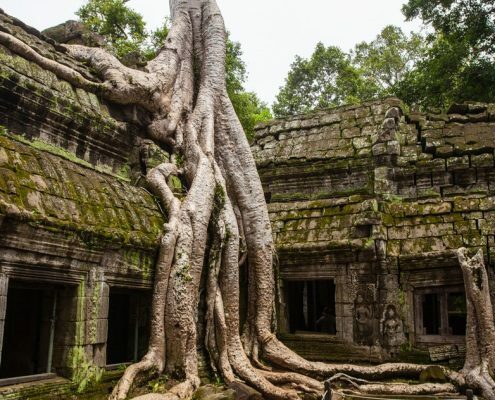 Located in a remote area the temple was rediscovered in 1914 and cleared some 10 years later. It was reconstructed using the method of anastylosis by French conservator Henri Marchal during the 1930’s. Today the Banteay Srei is a very well preserved monument. Its exquisite ornamentation that cover most of the temple show great skill and precision. 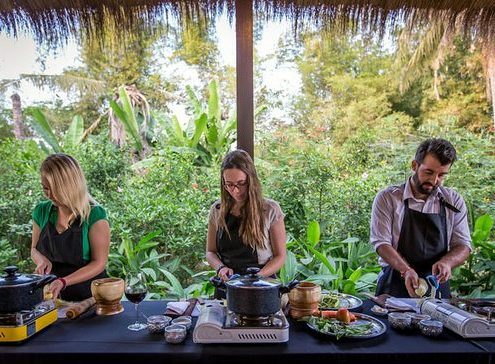 Continue with a cooking class at Bong Thom Home Stay Traditional house, and then enjoy your own meals for lunch. 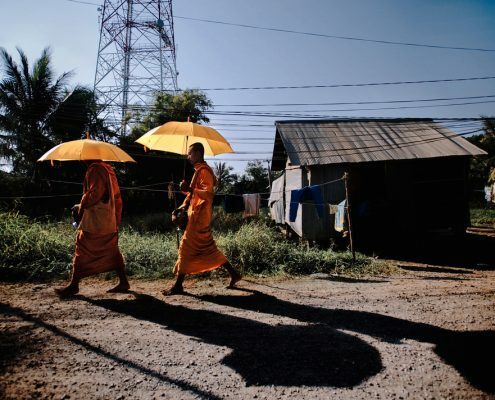 In the afternoon monk blessing at a family of old people at the country side/ witness person and they will describe their life during the Genocide of Khmer Rouge (1975-1979). Close the day with a Gala dinner at Thomanon or Kravan temple, and then back to hotel. You will be transferred to airport in the morning for a morning flight to Sihanouk Ville at around 10AM. Upon arrival, our driver and local assistant will pick you up and get you for lunch at Sunset Restaurant of Independence Hotel. After lunch transfer to port station for joining Song Saa Private Island’s boat. You will have a free time at your own leisure in Song Saa Private Island. Overnight at Song Saa Private Island. 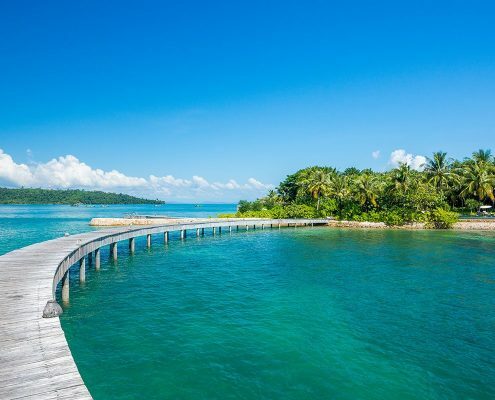 These days are your free days to enjoy the private island of Song Saa. Enjoy your stay in a paradise, with beautiful turquoise blue water, warm weather, sea breeze, and all the goodness of an island life could offer. Lunch will be at Sokha Hotel, and dinner at Rosewood Hotel where you will stay overnight. Today we start to visit Royal Palace (Silk pagoda), Royal Palace, built by the French in 1866 on the site of the old town, and the Silver Pagoda, located within the Royal Palace, the silver Pagoda is so named because of its floor, which is made up of 5000 silver tiles, the treasures are a solid gold Buddha encrusted and weighing 90 kilos and a small 17th century emerald and baccarat crystal Buddha. National Museum, also called Musee des Beaux-Arts. A French archaeologist and painter, Georges Grislier, designed it in Khmer style in 1920. The museum contains a collection of Khmer art – notably sculptures – throughout the ages (although some periods are not represented). Most of the exhibits date from the Angkor period but there are several examples from the pre-Angkor era. Lunch at Khema Restaurant. Afternoon visit, Tuol Sleng was used as S-21 prison ad interrogation facility during Pol Pot Regime. The building now serves as a museum, a memorial and a testament to the madness of the Khmer Rouge regime. Visit Russian Market (Phsar Toul Tom Poung) Toul Tum Poung market is often referred to as the Russian market because of its popularity among Russian expatriates during the 1980s. This market is popular to collectors of genuine antiques; also, for those looking for good reproductions. Filled with stalls selling sundry souvenir items (silk scarves and bags, woodcarvings, etc.) and clothing, Toul Tum Poung is a well-frequented market among tourists. Additionally, a handful of air-conditioned “export” shops have cropped up that offer factory over-run designer clothing at hugely discounted prices. Dinner at Topaz Restaurant and overnight in Phnom Penh at Rosewood Hotel. 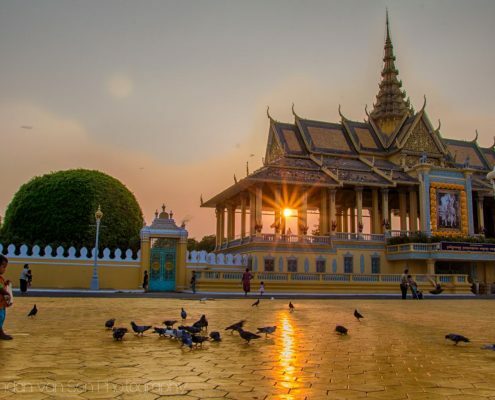 Free on your own leisure until transfer to Phnom Penh International Airport.